Brian C. Rosenberg, the sixteenth president of Macalester College, began his tenure at the college in August 2003. 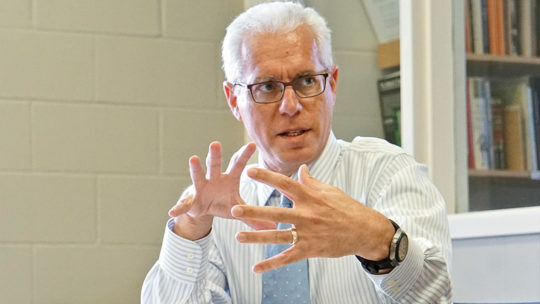 Rosenberg is active nationally, serving as a member of the Leadership Circle of the Presidents’ Climate Commitment, the Council on Foreign Relations’ Higher Education Working Group, the Presidents’ Trust of the Association of American Colleges and Universities, and as a member of the board of the Teagle Foundation. He is a past chair of the board of the Associated Colleges of the Midwest, the American Council on Education’s Commission on International Initiatives, and of the Presidents’ Council of Project Pericles. Within Minnesota, Rosenberg is a member of the Itasca Project, an alliance of more than 50 leaders drawn from the private, government, and social sectors with the goal of improving economic competitiveness and quality of life within the state. He is the sole representative from a private college and one of only three college presidents on Itasca. Rosenberg is a member of the Allina Health Board of Directors and is a member of the board of Wallin Education Partners. He is a past member of the board of trustees of the St. Paul Academy and Summit School, a K-12 college preparatory day school. Rosenberg champions the liberal arts college in the United States: “The liberal arts model rests on a belief in the transformative power of ideas, the necessity of collaborative action for the common good, and the importance of individual self-determination.” He has been quoted in the press on a variety of issues including higher education access and quality, tuition costs, and college rankings. Prior to becoming president, Rosenberg was dean of the faculty and an English professor at Lawrence University in Appleton, Wisconsin. Rosenberg served as an English professor and chair of the English department at Allegheny College in Meadville, Pennsylvania, from 1983 to 1998. A Charles Dickens scholar, he has written numerous articles on the Victorian author and other subjects as well as two books: Mary Lee Settle’s Beulah Quintet: The Price of Freedom and Little Dorrit’s Shadows: Character and Contradiction in Dickens. Rosenberg served as a trustee of the Dickens Society from 2000 to 2004. A native of New York City, he received a BA from Cornell University and an MA and a PhD in English from Columbia University.